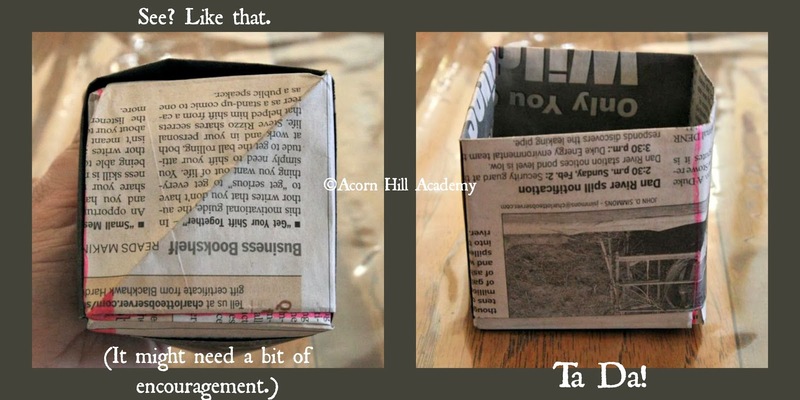 Acorn Hill Academy: Seed Starting: Origami Pots! This year, I am DETERMINED to do a little gardening. I love growing things, although I haven't tried gardening for food since setting up my own household. I like flowers. Since having children, and especially since starting homeschooling, I haven't made as much time for any kind of gardening. However, my children have wanted to have a vegetable garden for years, and now that Isaac is 6, I think we could handle giving it a try. We're going to make some small raised beds, and see how it goes. A year or so ago, I picked up a book on organic gardening. The author recommends raised beds for gardening here, for a couple of reasons. First, we have red clay soil, and it's a bugger to amend it so plants can grow. I've been told that root vegetables are nearly impossible in our clay soil. Secondly, you don't have to try to till up soil, which spreads weed seeds and means a lot of work trying to keep ahead of plants you don't want in your garden before you've even gotten started. From talking with several people in our area, I've learned that raised beds are the way to go here, so that's what we're going to do. 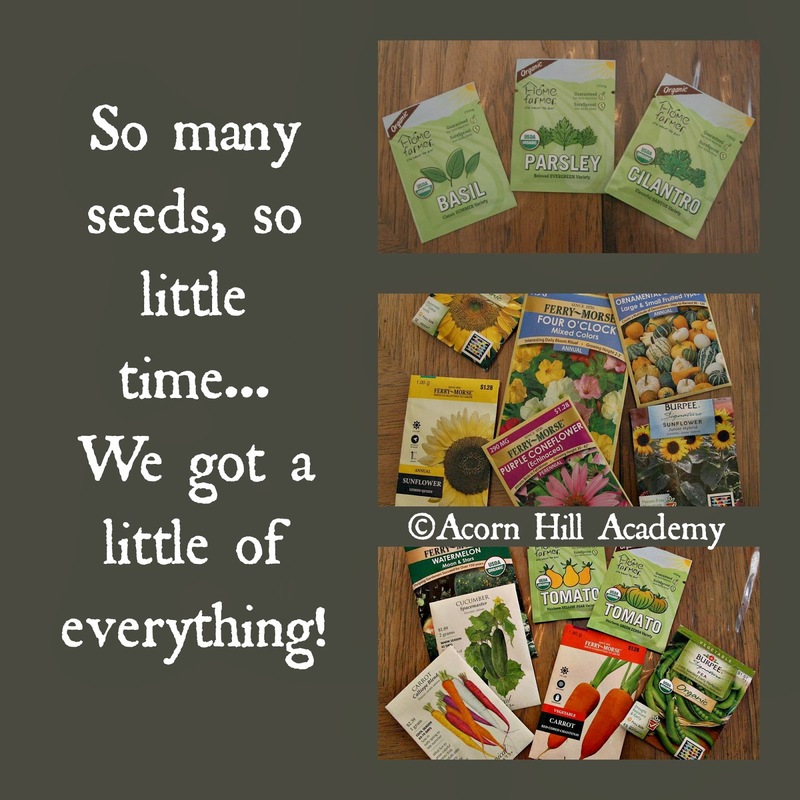 We decided to try starting some of our own seeds. My 6 year old is so excited about seeds, he can hardly stand it. I let him choose two packets of seeds from Walmart while we were there this week. He chose an assortment of gourds, and cone flowers. He wanted to go outside and plant them RIGHT THEN, and it's been difficult convincing him that we need to wait a little while yet. Starting some seeds in the house is a wonderful way to wait these last few weeks before we can plant things outside. Seeds need to be planted in something, and I didn't want to buy seed starting thingies. 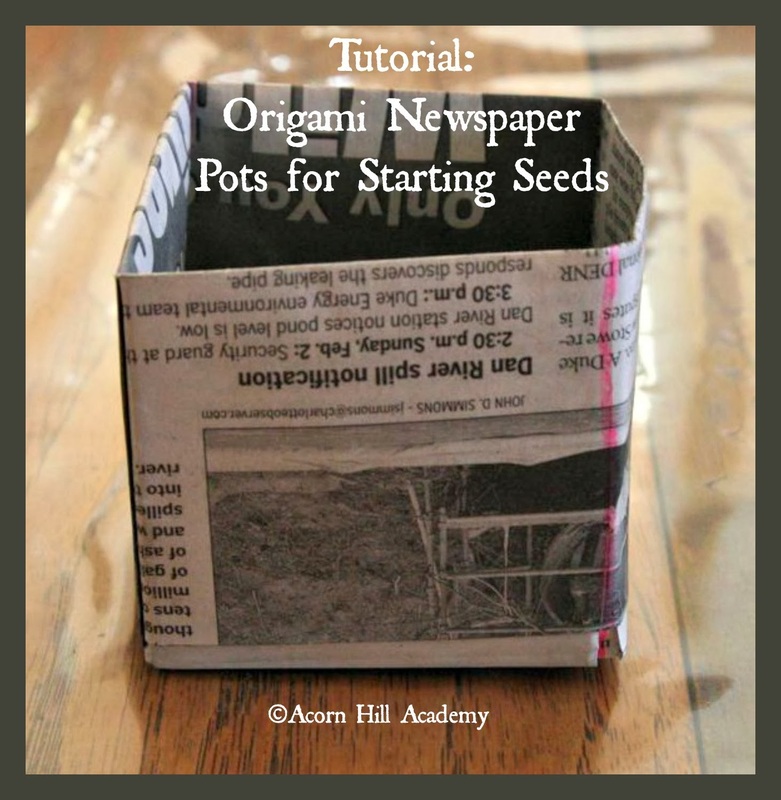 I searched the internet for ideas, and learned how to make my own pots, origami-style, from newspaper! You can plant them directly into the soil, and the paper will decompose. This is *fantastic* because I won't have more things to store in the garage! Once you've assembled your supplies, you can get started! First, get your newspaper. I bought newspapers on Wednesday, and got to read some lovely recipes while I was folding pots, as well as discovering that one of the papers has colored comic strips, even during the week! I love reading comics in the paper. I love the crossword puzzles, too. But I digress. 1. 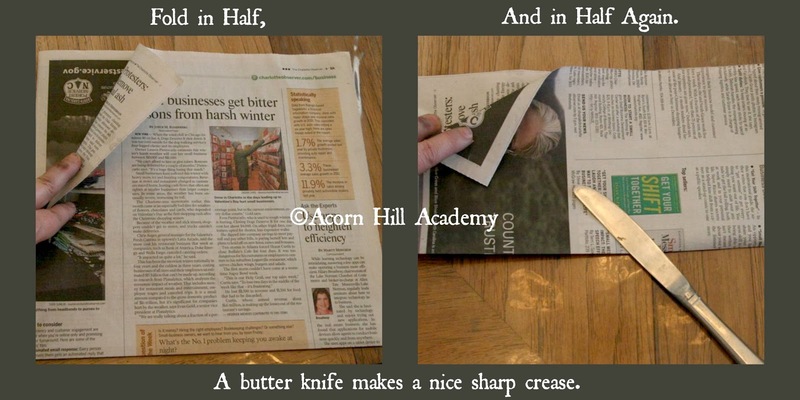 You will need to tear your paper down the center crease, so that you have individual sheets of newspaper. A butter knife works really well for separating them, and you can do several sheets at once that way. 2. Next, we start folding! 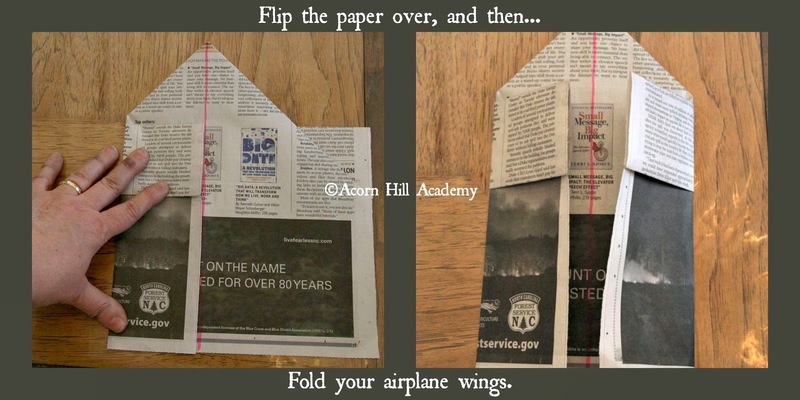 Fold it exactly in half, overriding the original fold, so the top and bottom edges match. 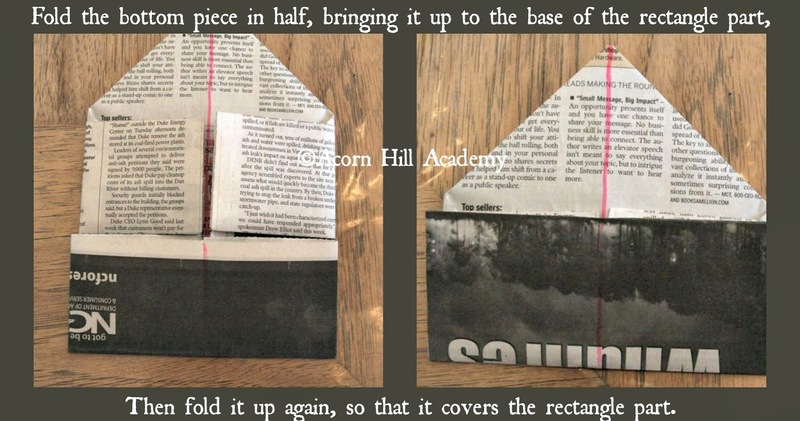 Then, fold it in half from left to right, so that you have four loose corners together at the top. You can use your butter knife to make your creases. It will be easier as you go along, just like with regular origami, if you make sharp, precise creases, but there is no need to worry about that too much..
3. Unfold your last fold, so you have your long sheet folded in half just once. 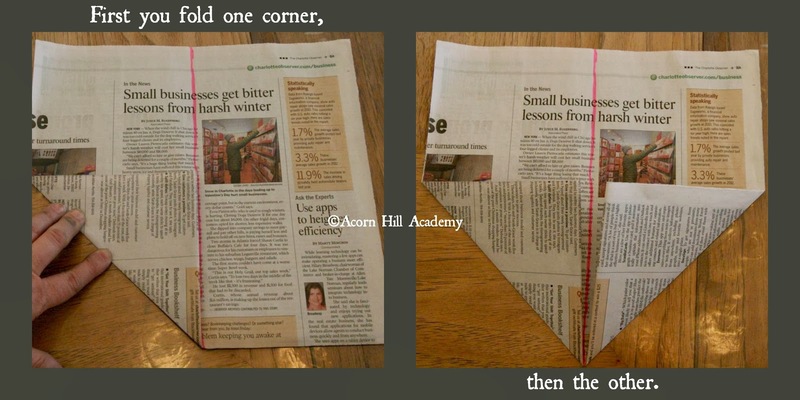 Then, fold the corners in to the center line, as if you were making a paper airplane, or a newspaper hat. I marked the center with my favorite hot pink Sharpie so you could see what I was talking about. 4. Turn your paper so the point is at the top, and fold the top layer, at the bottom of your paper, in half up to the bottom of the triangle. 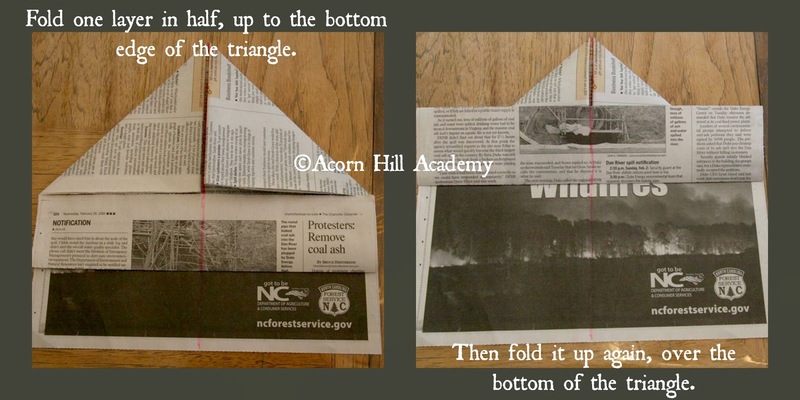 Then, fold it again, up over the bottom of the triangle, using that bottom edge as a guide. 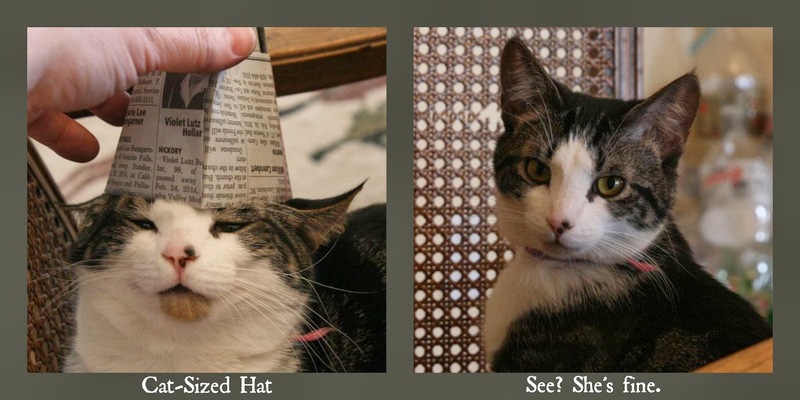 It still seems as though we might be making hats, doesn't it? 7. Now, look at your construction at this point. If you unfold it a bit, you can look inside and see little pockets. 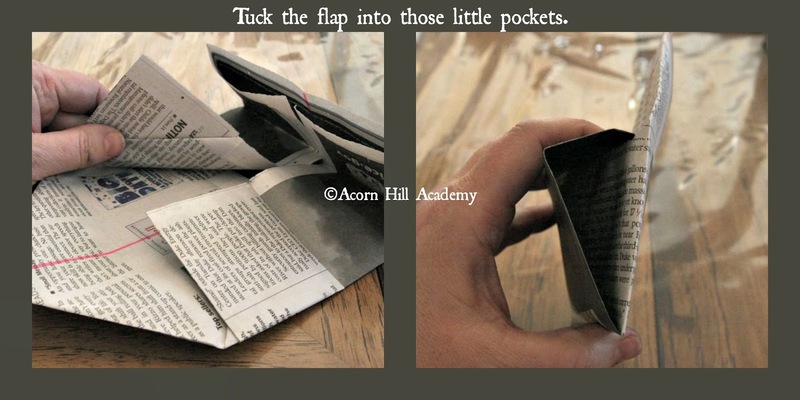 You want to tuck the flap of your paper into those little pockets. Those might not seem like important folds, but if you've ever done origami paper folding, you know that each crease has a purpose, even if it's not immediately apparent. Trust me, folding the triangle over on both sides will make your pot-making experience more pleasurable. 10. 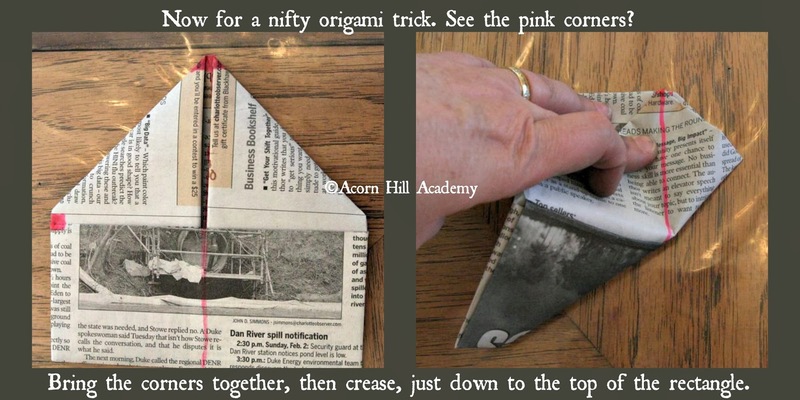 This next fold is a cool origami trick. Look at the pictures below, and note the two pink corners, one at the top and on on the bottom left corner of your triangle. Take that top corner and bring it over to the bottom corner, and crease. You only need to crease to the base of the triangle, not all the way down. 11. Put your hand inside the pot, and expand it out into a three-dimensional creation. 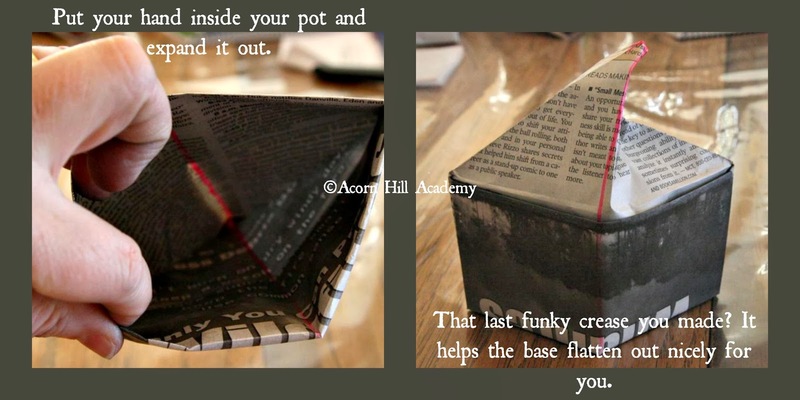 See how that tricky little triangle fold we just did helped the base of the pot fold itself flat? 12. You might need to "encourage" the base of your pot to do what you want it to do, but it will turn out with a nice flat base. It may not sit exactly flat on the table, but that will be solved in a moment. 13. Now your pot is ready to be filled with dirt! 14. 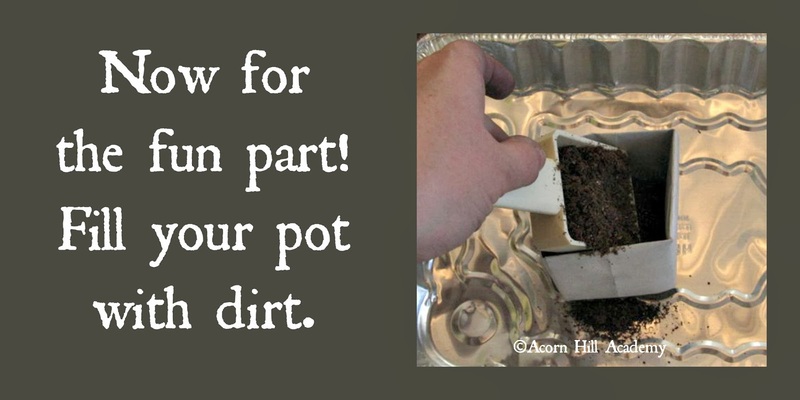 Once you have dirt in your pots, they are ready for seeds. Poke the seeds into the dirt, water them, and put them in your tray. I used disposable 9"x13" cake pans I purchased at the grocery store. I had originally intended them for some freezer cooking, but never quite got around to it. It worked out better this way, actually, because the lids are too tall to make them practical for the freezer, but they make wonderful mini-greenhouses. 15. When you've planted enough pots to fill a tray, you can put the lid on your pan (if you have one) and set them in a sunny window to germinate. There you have it! I will keep you posted on our gardening process. It's always so exciting when the seeds start growing, isn't it? I have killed many, many seedlings in previous gardening attempts, but this year, I have children who can help me remember to water them and keep the kittens away (I hope).